With the summer’s high temperatures scorching everything above the ground and below the ozone, drivers are naturally encouraged to get their broken air conditioners fixed to avoid looking like a giant sweat when hopping out of their vehicles. 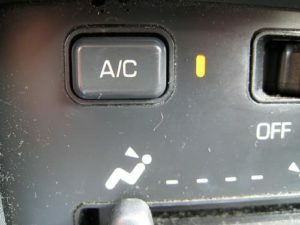 Be aware, the driver’s personal diagnosis of a broken air conditioning system may just be another common misconception. All the system may need is a good recharging. Whatever the case for a faulty air conditioning system is, it can cost the vehicle owner an upwards of hundreds of dollars at a repair shop. However, with the proper knowledge, the owner of the vehicle can potentially save hundreds of dollars by recharging the air conditioning system themselves. There are a few needed tools to begin the recharging process. Among these items are a charging hose assembly, A/C pressure gauge, gloves, goggles, and the type of canned refrigerant that is compatible with the car’s A/C system. It is imperative to wear gloves and goggles prior to recharging to prevent any kind of injuries. 1) Remove the cap of the low pressure service port. It is located under the hood, in between the air conditioning compressor and the car’s firewall. 2) Roll the windows down and start the engine. Then, turn the A/C up all the way to the highest setting. Open the doors and leave them open as well to prevent any internal fumes from building up. 3) Shake the refrigerant can and attach it to the charging hose assembly. Attach the open end of the hose to the low pressure port of the vehicle. Ensure that the hose is fully intact by tugging on it gently. 4) Make sure the pulley of the pressure gauge is cycling on and off. This means that the compressor is running. 5) Hold the refrigerant in and upright position and release the refrigerant into the vehicle’s air conditioning system. Periodically take a pressure reading assessment to ensure the system is not being overcharged. Finish the charging by detaching the can from the hose, and hose from the low pressure post. Be sure to close the low pressure port with the cap that was taken off. Finally, check to see if the air conditioner is blowing cool air. Remember not to stress if you do not feel comfortable performing these procedures yourself. You can always get it looked at by a local mechanic, just be sure to ask for a price quote beforehand.